Hey, what about audio and video editors? Being able to install Linux apps on Chrome OS opens up some fascinating new possibilities — particularly if you're an advanced user. After all, while a Chromebook's standard combo of web apps, Chrome apps, and Android apps is more than sufficient for most folks' needs, some of us still require (or maybe just prefer) traditional local programs for certain specific purposes. The presence of Linux apps on Chrome OS means we can have our cake and eat it, too — by enjoying the speed, simplicity, and security of a Chromebook while also embracing the occasional heavy-duty desktop app. Unless you're a Linux veteran, though, figuring out where to begin isn't exactly easy. Linux apps are a whole other world from the regular realm of desktop software, in terms of both what titles are available and how you go about finding and installing them. Well, consider this your cheat sheet: I've spent ample time exploring and testing a variety of productivity-oriented Linux apps to see what works best and makes the most sense in the Chrome OS environment. These are the programs I'd recommend — and they're all completely free to use. Before you begin, you'll need to confirm that your Chromebook is capable of running Linux apps and then set it up to do so. If you haven't yet done that, click over to my step-by-step guide to get started — then come back here once you've got everything up and running. Nowadays, you've got no shortage of options for word processing, spreadsheet work, and presentation creation on a Chromebook. You can use Google's own Docs office suite, of course, or you can turn to Microsoft's web-based Office apps. If you have a paid Microsoft 365 subscription, you can even install the Office Android apps and use those on your Chrome OS device. For folks who prefer a non-cloud-connected office suite, though, LibreOffice is the path to pursue. 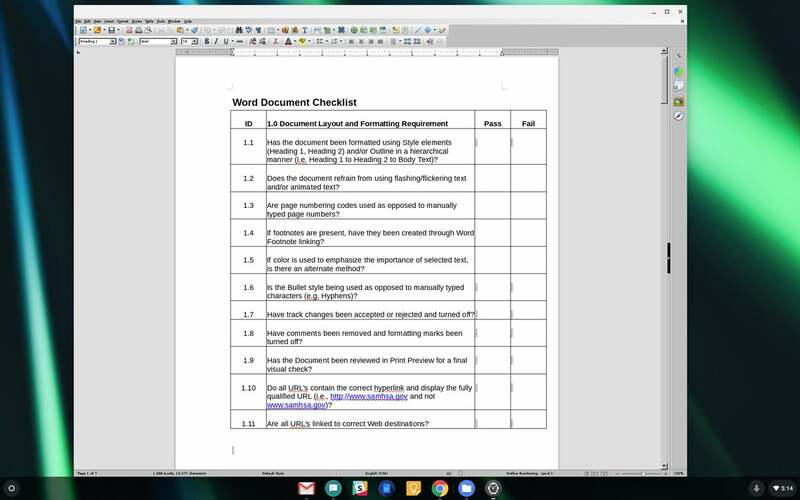 The program gives you a polished and professional word processor, spreadsheet editor, and presentation editor — all of which have familiar-feeling interfaces and are easy to use. There's not much LibreOffice can do that you couldn't also do in Docs or Word, but if you'd rather stick with a strictly local setup — and you don't have an Office 365 subscription to go the Microsoft Android app route — it's a fine alternative to the standard options. 1. Open the Terminal app in your Chrome OS launcher. ...and press enter. You'll then have to press enter a second time to confirm. ...and press enter. Press y and then enter to confirm, and then prepare to wait a long time while a bunch of text scrolls down your screen and the installation completes. Prefer an uncluttered space for writing? Check out FocusWriter, a super-simple word processor designed to be free from distractions. FocusWriter gives you a minimalist interface for composing your thoughts, with a color or image of your choice setting the mood and nothing else on screen to steal your focus. Hovering over a menu area at the top of the app reveals some basic formatting commands — and that's about it. FocusWriter provides a minimalist environment for distraction-free composition on a Chromebook. 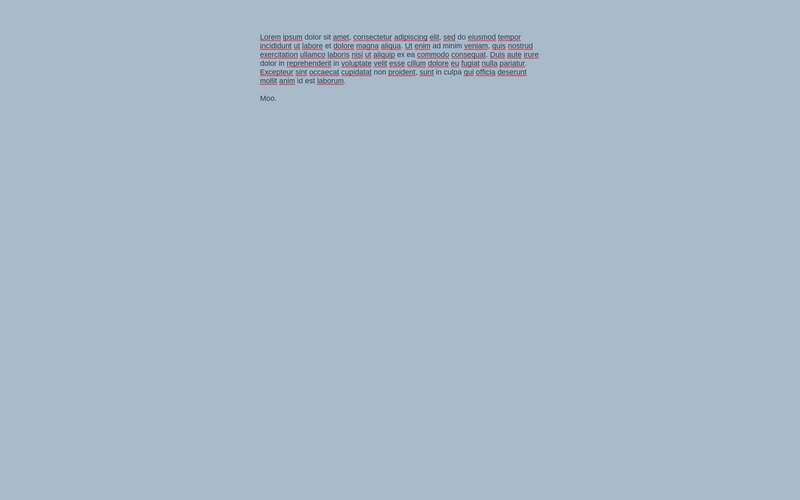 One quick tip: By default, FocusWriter's font size on Chrome OS is almost unreadable. You can fix that by hovering over the topmost area of the app, clicking the Settings menu, and selecting "Themes." Find a theme you like, then click the "Duplicate" button. Once you've done that, you'll see an "Edit" button that'll allow you to customize the theme. I'd suggest changing the font to Arimo and the size to 18 for far better readability. You might also want to look in the "Preferences" section of that same Settings menu to adjust the app's default format for saving files and to activate an option for automatically saving changes as you work. ...and press enter. You'll have to press enter a second time to confirm. ...and press enter. Press y and then enter to confirm, and then wait for the installation to finish. Web-based email interfaces may be all the rage these days, but some folks still prefer good old-fashioned desktop mail clients for their superior speed and lack of browser reliance. That traditionally hasn't been an option on Chrome OS, but — yep, you guessed it — the presence of Linux apps makes it possible. 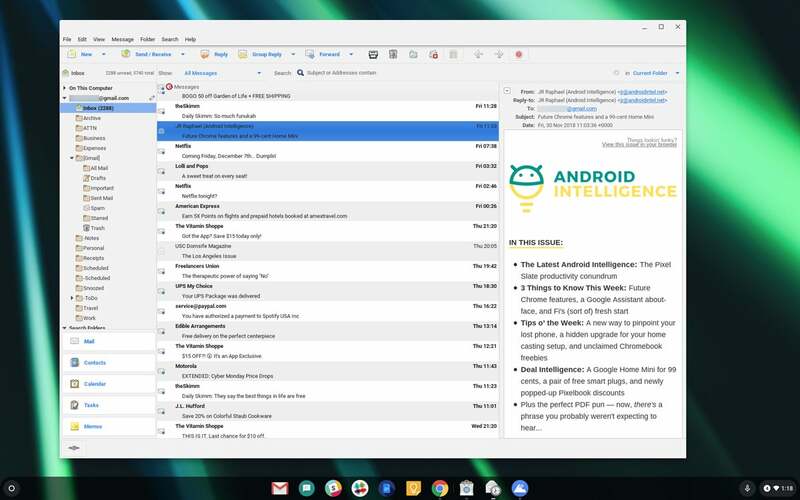 The best all-around Linux mail client to consider for a Chromebook is something called Evolution. Evolution puts your email, calendar, and contacts — along with tasks and memos — into a single Outlook-reminiscent interface that's both snappy and easy to use. It works well with Gmail or any other standard POP- or IMAP-enabled account. Evolution gives you an Outlook-like interface for local mail, calendar, and contact management. The lack of a true native Slack app for Chrome OS can be a bit of a bummer. Sure, you can use the website — and even make it look pretty, if you want — but neither that nor the Slack Android app feels entirely like a desktop experience or gives you the full set of keyboard shortcuts present in the Windows and Mac versions. Here's the answer: Snag the official Slack Linux app, and get back to the compromise-free chatting experience you enjoy. 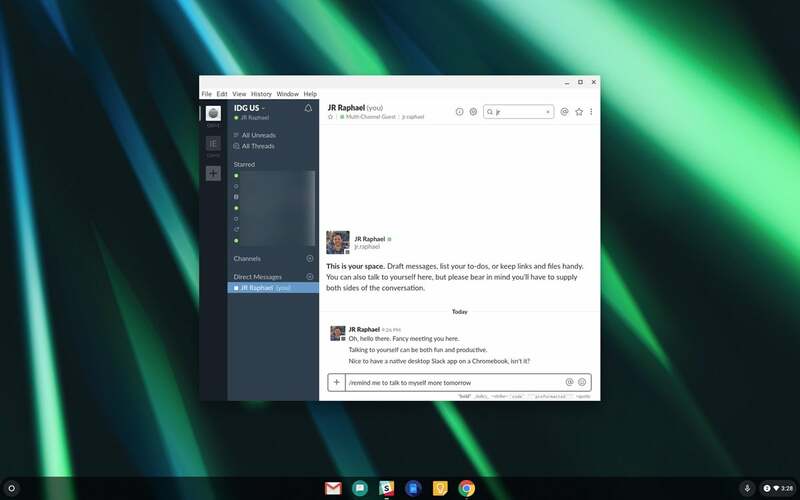 A native Slack desktop app on Chrome OS — imagine that! The installation for this one is a bit different from the others in the list, as the easiest way to grab the app is to download the file directly from the Slack website and then install it onto your Chromebook. 1. Go to Slack's Linux Downloads page and click the button to download the 64-bit .DEB file. 2. Once the download has finished, open up Chrome OS's Files app. Click on your "Downloads" folder in the left-hand sidebar, then find the file you just downloaded — which should start with "slack-desktop" and end with ".deb" — and drag it over into the "Linux files" folder on the left side of the screen. 3. Now click that "Linux files" folder, find the file there, and double-click it. 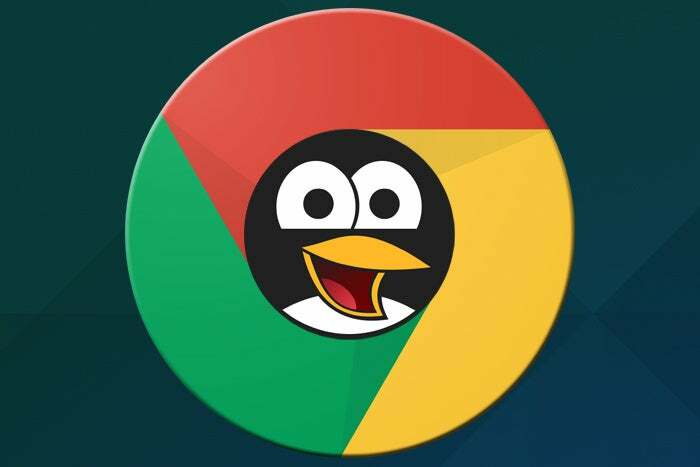 Your Chromebook should then prompt you to install the application. Click the blue "Install" button, then sit back and wait for the process to finish. 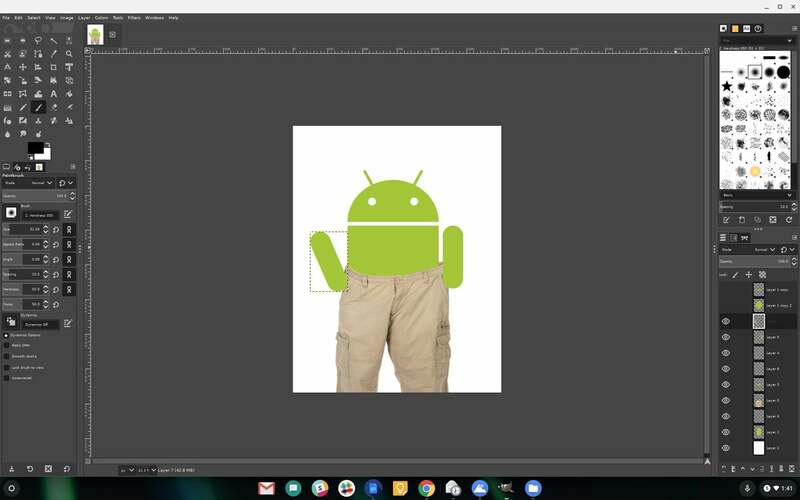 The lack of a Photoshop-caliber graphic editing tool has long been a gap that's kept me, personally, from using Chrome OS as a full-time computing platform. I can get by with web-based tools like Pixlr or Photopea while traveling or doing light work around the house — and so those have typically been the times I rely on a Chromebook — but when I'm sitting at my desk during the workday, the absence of a fully-featured image editor really impedes my workflow. GIMP is the missing piece of the puzzle. The unfortunately named app — short for GNU Image Manipulation Program — is a robust graphic editor that rivals Photoshop in functionality. It isn't the most intuitive program and definitely requires a bit of a learning curve, but once you figure out its various quirks and intricacies, it's quite capable. If you need a Photoshop-caliber graphic editor on Chrome OS, GIMP is the program for you. GIMP is also an excellent demonstration of the complexity and confusing nature of Linux apps: For reasons I don't fully understand, the standard string of commands for installing GIMP on a Chromebook currently gets you a dated version of the program that doesn't play particularly well with Chrome OS. In order to get the most current (and fully Chrome-OS-compatible) release, you'll need to install GIMP via something called Flatpak — a standalone software deployment platform that runs within the Chrome OS Linux container. 3. Press enter and wait for the process to complete. Once everything is done, open the Chrome OS launcher (by pressing the Search key or clicking the circle icon in the lower-left corner of the screen). Type the letter g, and you should see "GNU Image Manipulation Program" pop up as a choice. If you ever need to connect to a remote server and upload or download files, listen up: Awkward workarounds are no longer required. 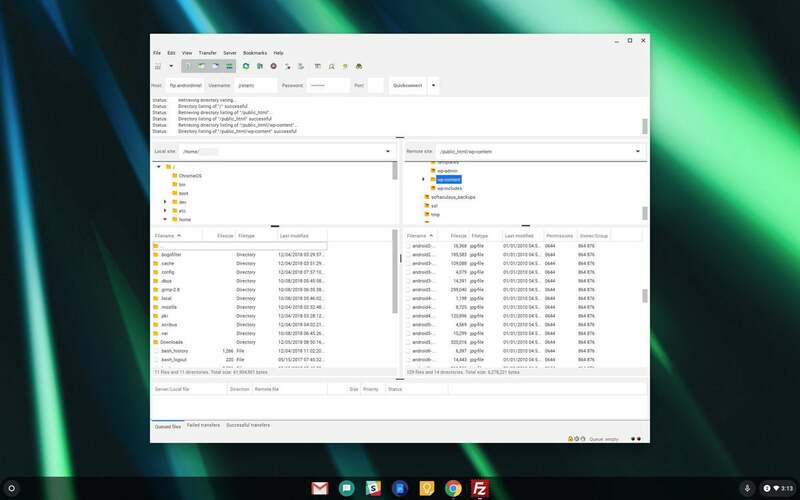 FileZilla is a no-frills FTP client that makes it easy as can be to transfer data between your Chromebook and a server. With FileZilla, dragging and dropping files between a Chromebook and a remote server is no longer a chore. The Chrome browser is the heart and soul of Chrome OS — but sometimes, you need access to a different desktop browser. Whether you're testing a website or just craving some variety, the Firefox Linux app is a fantastic way to bring some browser diversity into your Chromebook setup. Worlds collide with the presence of the Firefox desktop browser on a Chromebook. Exceptional audio and video editors are among the most sought-after niche utilities currently missing from the Chromebook picture — and Linux certainly has its share of serviceable options. Those apps aren't on this list yet, however, because Google's Chrome OS Linux implementation doesn't yet support audio or accelerated graphics and thus isn't able to properly run such programs. Those areas are confirmed to be under development already and are expected to be added into the equation sometime in the foreseeable future. I'll update this list once that happens and offer up some audio and video recommendations then. In the meantime, check out my sprawling list of advanced Chrome OS productivity tips and think about what Android apps might further flesh out your Chromebook experience. Chrome OS is constantly evolving and expanding, and so, too, will all of these Chromebook resources. 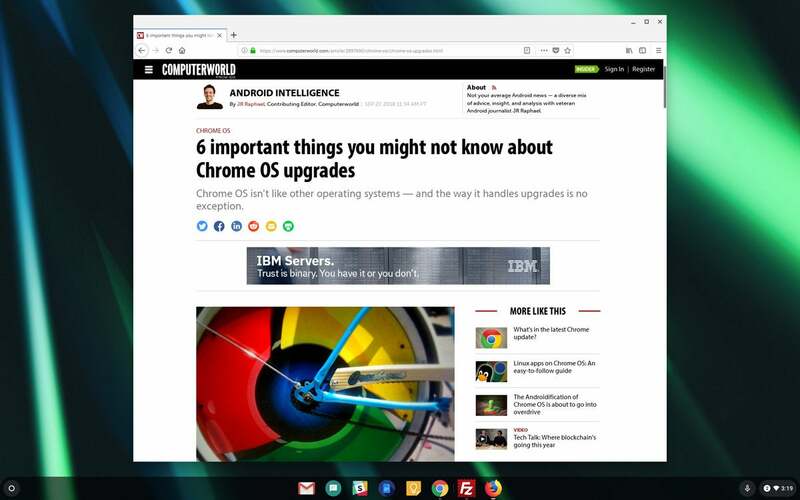 This story, "The best Linux apps for Chromebooks" was originally published by Computerworld.